The Burton and Loughborough franchise commenced trading in 2005 and is a successful and profitable business that has seen a steady year on year growth in turnover. The current owners have always offered exceptional customer care which has resulted in a strong and loyal customer base on which the next owner can build further. Currently the business runs 7 rounds over four days with two vans; allowing for immediate growth to maximise both vans. Due to the increase in the size of orders, an additional van is required for the Christmas week deliveries. 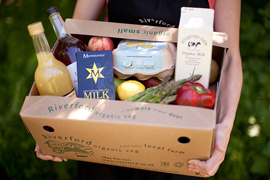 The hub, shared with a neighbouring Riverford business owner, is conveniently situated within the territory, and the delivery drivers are all established, hardworking, loyal and self-sufficient enabling the new owner to focus on marketing and further growth. The business is for sale due to a change in personal circumstances, however the current owner’s investment will continue, and full support will be provided during the sale transition. The business has an excellent range of urban and rural households and has the ‘Rural Capital of Food’, Melton Mowbray, within the territory along with the major conurbations of Loughborough, Burton on Trent and Derby. With an asking price of £60,000 and a turnover of £549,584, this represents an exceptional opportunity to acquire an ethical and rewarding franchise business in a fast-growing business sector. To find out more about this opportunity and/or to ask us a question about the business, please fill in the form below.